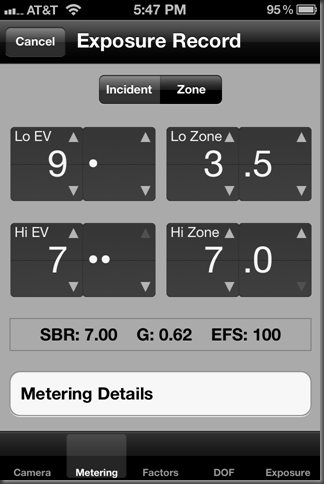 Soon there will be a new generation of Phil Davis' BTZS ExpoDev available for iOS devices. This is a completely new and redesigned version of ExpoDev but it will use the same exported Plotter film test files as previous versions. It promises to be easier to use and will have many new features in its final form. While there are many things still left to do, a lot of the UI is in place and it has gotten to the point where I am ready to share some initial screen previews. What you're seeing below is the actual ExpoDev program as it runs on an iPhone. BTZS ExpoDev will support both the iPhone and iPod Touch devices (it will also run on an iPad but not as an iPad sized app). Disclaimer: This is an early preview as much work remains to be done. I do hope to have this available by spring but there are no guarantees as Apple's App Store approval process and timeline is largely out of my hands. 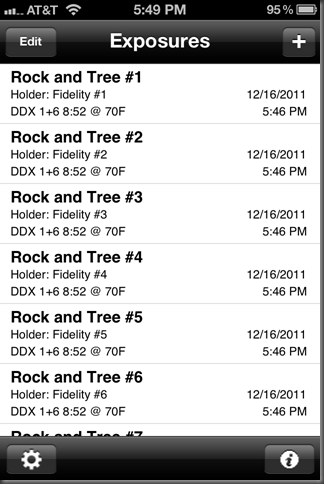 When you start ExpoDev for iOS, it starts with the list of exposure records that you have previously created (note: all data in these screen shots is simulated and/or placeholders so don't expect it to make much sense even if you are familiar with ExpoDev). From here you can browse and manage previously created exposure records, view their details, etc… You can also access app settings and defaults and of course, create new exposure records. Here is the first screen of a new exposure record. 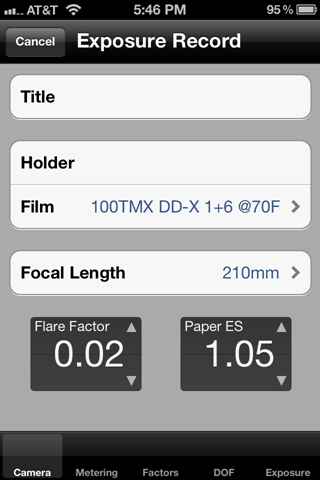 Here you can set the title, film holder, select your film and developer combination from your list of imported film tests, select the lens in use and of course tune the Flare Factor and Paper ES values. Along the bottom is a set of tabs. ExpoDev exposure records have several sections for each of the logical parts of an exposure: Camera setup, Metering, Exposure Factors, DOF, and the final Exposure. You can freely moving between these areas by selecting the active tab at the bottom of the app at any time. 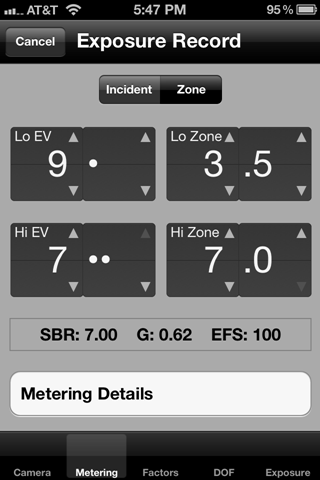 Here's two examples of the Metering tab, showing both Incident and Zone metering. 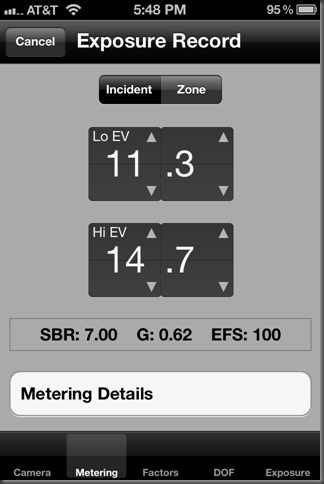 You can set which metering mode is your default in the app settings as well as change it on the fly on the metering tab. 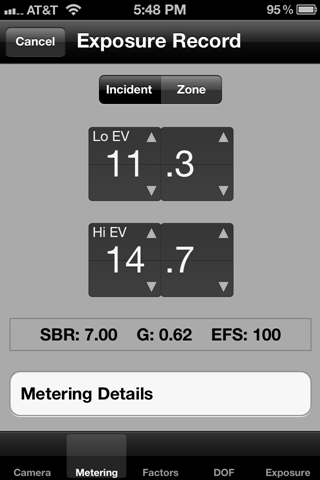 These two screens also show that you can work with meters that use decimal EV units as well as meters that display EV in 1/3rds. You can adjustment these and other similar values with simple taps without ever having to bring up the iOS keyboard. You'll notice that these values are separated into segments. To change a value, you tap either the top or bottom of a segment to change the value up or down. You do this independently for each segment, which will allow you to quickly enter or modify values. The next exposure screen is the Factors screen which allows you to set filter factors, bellow extension or close-up factor and a general exposure adjustment in 1/3 stop increments. 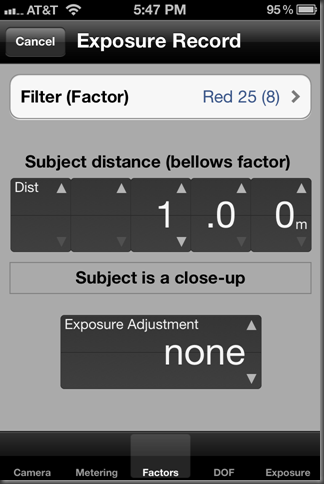 ExpoDev will come set up with common filters and their factors but this list is fully editable in the app settings. 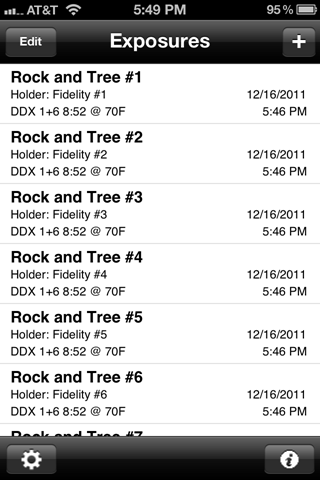 You can add and remove filters, change their factors, etc… to match your equipment and needs. 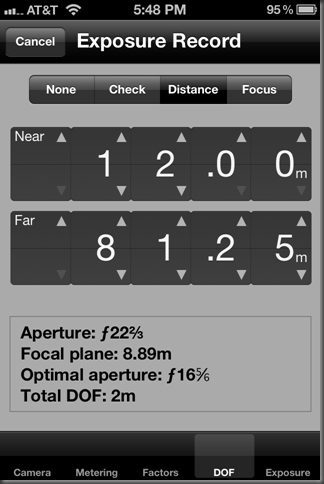 Next up is the DOF or Depth of Field tab. It supports several modes from simply checking DOF to calculating and enforcing DOF based on several factors. 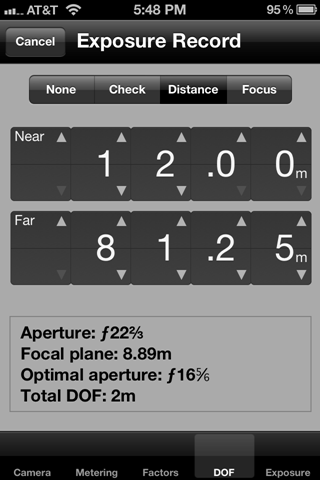 What is shown below is calculating DOF based on near and far subject planes. Again you'll notice the multi-segmented value selectors for fast data entry. This allows you to quickly enter both small and large numbers efficiently with a minimum number of finger taps. The example below shows working in Metric measurement units but you can also work in Imperial units (i.e. feet and inches). 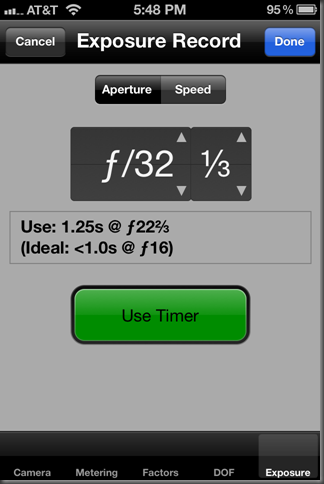 Here you can choose to set either the Aperture or Shutter Speed or time. 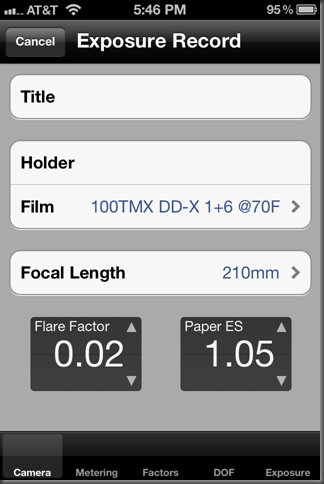 If you've used the DOF feature, ExpoDev will select exposure settings that preserve your selected DOF. Using Plotter's exported film data it will also correct the exposure for reciprocity failure, yielding very accurate exposures that are based on your personal film test data. 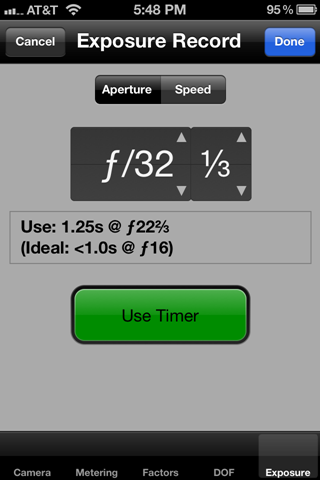 It will also offer you a timer to use as necessary for longer exposures. When you're done, it will add the exposure record to the list of exposure records where you can views the details or start again with a new exposure. ExpoDev is still a work in progress, including the UI you see above. Recently at the Phil Davis Memorial Photo Retreat in Death Valley national Park I ran some field trials with users and collected feedback. In the next round of app development I'll work in that feedback. I am hoping that a beta test version will make it out to testers in January and that hopefully by this spring, it will be available for purchase in the Apple App Store. In the meantime you can watch BTZS.org for announcements.